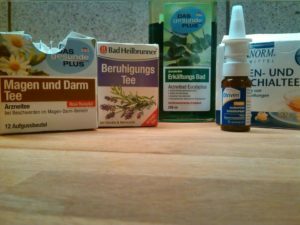 From unsettled stomachs to stuffy noses to bronchial maladies to stress…here in Germany, there’s a tea, bath liquid or spray for everything that ails you. ‘Tis the season AFTER the season. The one where lights, decorations, cookies, carols and resolutions give way to sniffles, body aches, congestion, fevers and –if you’re really lucky–eruptive digestive tracts with projectile capabilities that not even the most beefed up national defense can hold a candle to (nor would I recommend trying to hold a candle to it, for a variety of reasons). As folks file back into classrooms and offices, said venues become Ground Zero for long winter months’ worth of the time-honored pass-the-virus game. One difference is at the most fundamental level: the collective ‘tude toward the germ itself. Although Americans are not quite at the point of popularizing everyday use of surgical masks, we sure diddly-do rely on our hand sanitizers. Although many restrooms and medical offices in Germany furnish sanitizer dispensers alongside soap at the sink, common areas of public venues in the States–from supermarkets to hotels to stadiums to office building lobbies–are much more likely to have gel or wipe sanitizing stations. 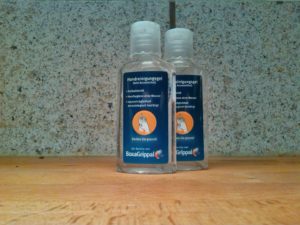 If you ask every German and American to empty their handbag or pockets (which could be easily misinterpreted, so let’s keep this theoretical), you are likely to see far fewer Purell bottles produced from Germans. It is simply not the go-to accessory like lipstick and a wallet that it seems to be for us Statesiders. The occasional old fashioned hand washing–maybe increased in frequency during the heavy contagion months–suffices for Germans. Ha! 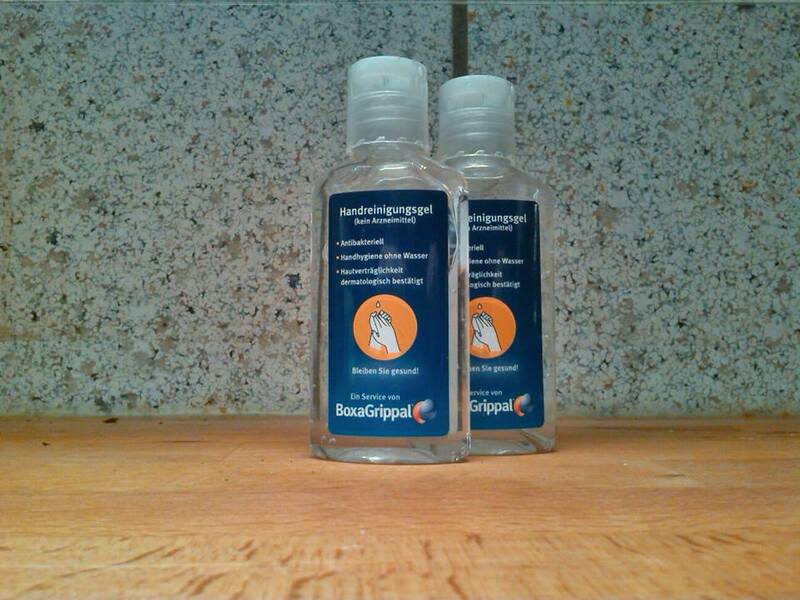 I did manage to unearth some sample-sized bottles of German hand sanitizer. It DOES exist…just not as abundantly as its U.S. counterparts. By way of contrast, German sensibilities where microbes are concerned seem to be more attuned to the feet. Here, it is much more common to remove shoes at the front door to avoid tracking in all manner of nasty critters, visible and invisible. This commonly extends to visitors (that they should remove shoes, not that they are nasty critters), with those thoughtful Germans even often having extra sets of “house shoes” (i.e. slippers) for guests. In kindergartens and some elementary schools, it’s off with the “street shoes” and on with the slippers once inside the building. 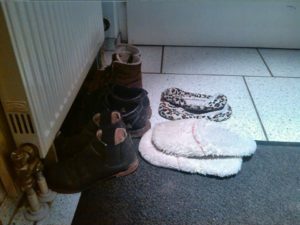 I try to play by the rules of a German household by encouraging street shoes–with all their microbes–to stay at the entryway. A bit deceptive about this photo is the implication that I conscientiously follow the second Golden Rule–slippers on…the tiles are cold! So, suppose that despite the vigilant hand sanitizing and shoe changing, illness has taken hold. What can we expect in terms of treatment and standard procedure? 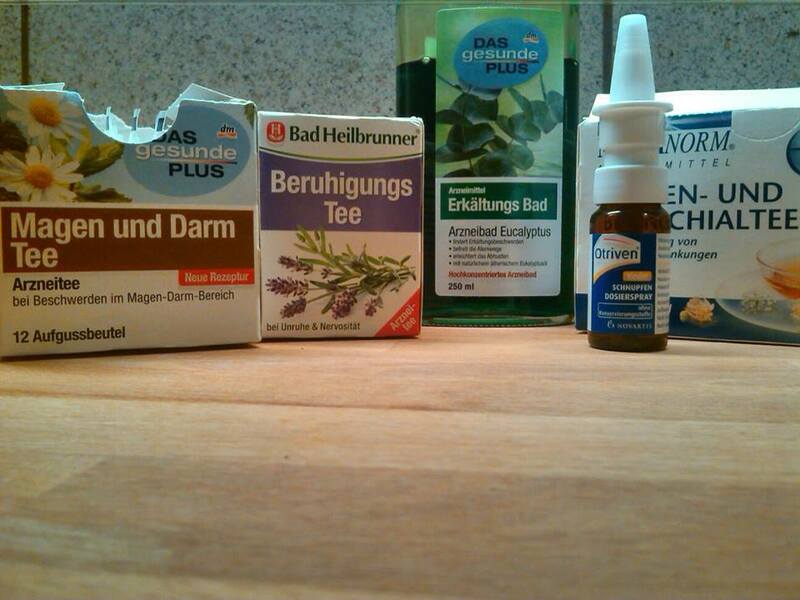 If we are talking about the onset of cold or flu-ish symptoms, expect a German to throw a warm scarf around the neck, drink herbal tea and rest. A trip to the Apotheker (pharmacist) for a consultation regarding gentle treatment (often plant-based syrup or tablets) may also occur at this point. Sports and exercise go on hold, as does work if symptoms escalate to moderate to severe. This is not a go-to-work-sick culture; in fact, doing such will earn you frowns instead of accolades. Around this time of year, many employees get “Krankgemeldet” by way of an “Arbeitsunfaehigkeitsbescheinigung” (just saying that word can put you in the hospital). Translation: they obtain a certificate from the doctor verifying illness to officially excuse their absence. This document is required by the employer by the third sick day at the latest and is necessary to trigger salary payment via insurance should an illness extend beyond six weeks (up till that point an employee receives his/her full salary as paid by the company). At this point, it should be noted that given these modern and business-intense times, German managers increasingly log into the office from home when they are under the weather. An American with the same cold or flu-ish symptoms is more likely to stumble to the OTC section of Walmart, Walgreen’s or Walsomethingorother to grab a box of whatever has a long list of unpronounceable ingredients that promises to knock away debilitating symptoms so you can rest and finally get back in the swing of things already. As far as absence from the workplace is concerned, we Americans are a funny and somewhat contradictory bunch. On the one hand, no one relishes the idea of a highly symptomatic colleague coming in and spreading sick germs (here’s where the sanitizing kicks into high gear). On the other hand, “powering through” one’s illness at work is regarded as a sign of grit and determination. Surely also a crucial factor in this sick-to-work habit is that the United States does not mandate companies to offer sick pay at the federal level; ill employees need to rely on state laws, city ordinances or individual company policy to determine how absence due to illness affects their paycheck. Unpaid sick days are to a certain extent protected under the Family and Medical Leave Act. All of this to say that grit and stoicism may have something to do with it, but it’s not the whole picture. -Germans hold much more to weather-temperature-health connection beliefs. For instance, sitting on cold surfaces or failing to wear a long enough winter coat could lead to bad kidneys! Wet hair in the cold is an invitation to a week sick in bed! Bare feet on cold tiles? Where are your house shoes! Also, before moving here, I had no idea how many afflictions could be caused by a small draft. -I was alarmed by the number of folks here who reported to suffer or to have suffered from “angina” Turns out this is a reference to “angina tonsillaris”, otherwise known to Americans as tonsillitis. No defibrillators necessary. -A commonly prescribed treatment here in Germany for chronic conditions of varying degrees and types is a “Kur” (resort therapy), which involves an extended stay at a facility that offers healing (or preventative) therapies in locations along the German coast or in mountainous regions that offer fresh air. Stays can last up to six weeks, are often covered by insurance (if sufficiently justified by a physician) and are an acceptable medical excuse for extended work absence. Respiratory ailments, circulatory problems and burnout are common conditions treated by resort therapy. It is my sincere wish that you make it through the winter season in robust health. As for me, it’s time to put on my warm socks, drink a cup of relaxation tea…and maybe sneak a dollop of hand sanitizer. If you plan on doing business with Americans, or even just visiting in your private time, you would be well advised to understand the cultural differences to Germany regarding illness, health care and/or basic vocabulary for a productive doctor’s visit. Book an intercultural training or English language course today. Be well!